R. Nicholas Burns is the Roy and Barbara Goodman Family Professor of the Practice of Diplomacy and International Relations at the Harvard Kennedy School of Government. He is Director of the Future of Diplomacy Project and Faculty Chair for the Programs on the Middle East and on India and South Asia. Burns served in the United States government for twenty-seven years. 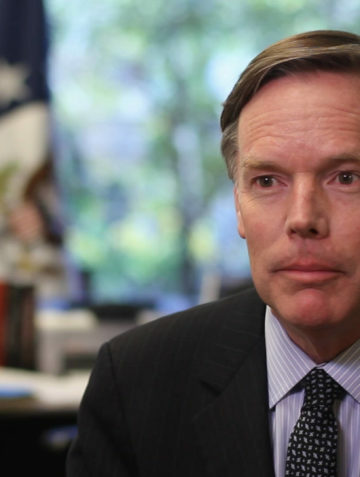 As a career Foreign Service Officer, he was Under Secretary of State for Political Affairs from 2005 to 2008; the State Department’s third-ranking official when he led negotiations on the U.S.–India Civil Nuclear Agreement; a long-term military assistance agreement with Israel; and was the lead U.S. negotiator on Iran’s nuclear program. He was U.S. Ambassador to NATO (2001–2005), Ambassador to Greece (1997–2001) and State Department Spokesman (1995–1997). He worked for five years (1990–1995) on the National Security Council at the White House where he was Senior Director for Russia, Ukraine and Eurasia Affairs and Special Assistant to President Clinton and Director for Soviet Affairs in the Administration of President George H.W. Bush. Burns also served in the American Consulate General in Jerusalem (1985–1987) where he coordinated U.S. economic assistance to the Palestinian people in the West Bank and before that, at the American embassies in Egypt (1983-1985) and Mauritania (1980 as an intern). Nicholas Burns has received twelve honorary degrees, the Secretary of State’s Distinguished Service Award, the Woodrow Wilson Award for Public Service from the Johns Hopkins University, the Boston College Alumni Achievement Award and the Jean Mayer Global Citizenship Award from Tufts University.